A campaign launched earlier this year to attract more business events to Newcastle, Port Stephens and the Hunter Valley has scored its first major win with confirmation of a 2015 convention worth up to $100,000 for the region. The Association of Australian Convention Bureaux (AACB) Staff Conference will be held at venues in Newcastle, Port Stephens and the Hunter Valley in August, 2015, after the Altogether Perfect marketing body representing the three regions successfully pitched to host the event. The conference will attract up to 100 delegates from convention bureaus across Australia and inject $100,000 into the local economy. Altogether Perfect spokesperson, Georgia Lazzari – Business Events and Conventions Developer for the Newcastle Convention Bureau – said the AACB conference was the first event the Altogether Perfect campaign had won for the region. “After our launch this year, the Altogether Perfect team has hit the ground running to draw more high-yield corporate events to Newcastle, Port Stephens and the Hunter Valley and this early win shows we are on the right track,” Ms Lazzari said. “Our combined region offers delegates the appeal of the city, the country and the coast and we are confident this powerful trifecta will help us win more major conventions for the greater Hunter,” she said. 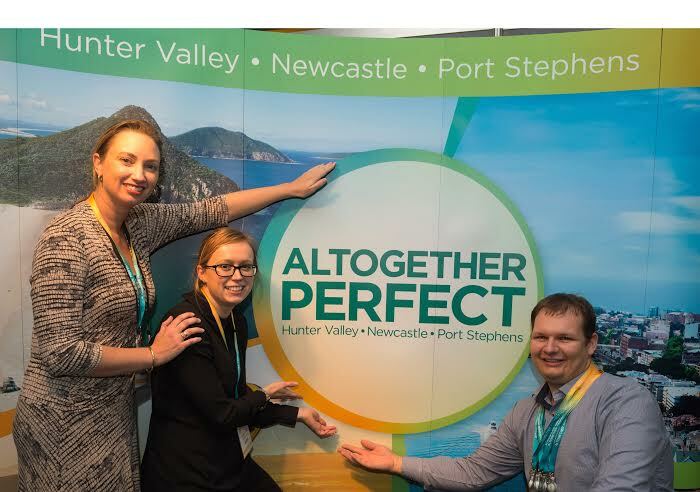 Launched this year, the $270,000 ‘Altogether Perfect’ campaign is the name for the collaborative marketing efforts undertaken by regional partners in the Hunter Region to attract and secure business events tourism. Backed by Newcastle Convention Bureau, Hunter Valley Wine & Tourism Association and Destination Port Stephens and supported by dynamic industry operators, the joint marketing group attends trade fairs and sales missions and host visits to the region by key conference organisers and media to build the appeal of the Hunter region as a premier business tourism destination. The campaign received funding through the Regional Visitor Economy Fund (RVEF) which is managed and administered by the NSW Government’s tourism and major events agency, Destination NSW.